The "Draft Horse Classic" in Grass Valley, California is the Western United States premier draft horse performance and competition event. Visitors come from all over the world. It is an event you will totally enjoy. The big horses are amazing! I was honored to see my painting advertised on billboards, banners, signs, clothing, throws, bags and programs around California. Wide wrap around canvas with painted sides. Archival limited edition giclee prints available on paper or canvas and giclee greeting cards available by special order. I have had the honor of this painting being accepted in the Ex Arte Equinus V international equine art contest by The Art Horse Magazine. There were nearly 1,000 entries from nations from all over the world. This painting is now featured on their web site under the "Paintings" category and in their soft and hard book featuring all the winners. 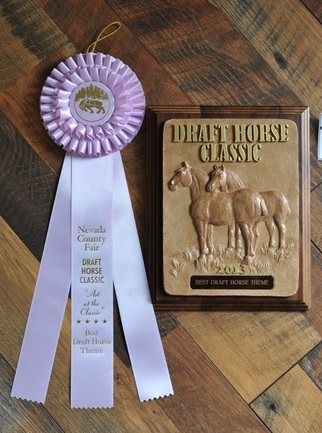 2014 Draft Horse Classic Ribbon and Plaque for Best Draft Horse Theme. 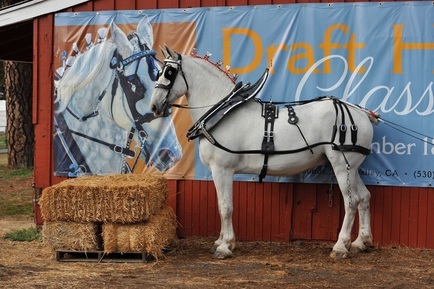 Here is Odie standing in front of one of the banners they made of my painting "Percheron Power". I could not believe it when I came across him in a stable. He is older now and has lost most of his dapples, but he is still an amazingly beautiful horse. Every time he performed they announced that he was the horse on the poster. Needless to say he was a very popular horse during this event. After the event we found out most of the banners and posters were gone except a couple they had saved for us. This is the latest of two paintings I have completed of the famous friesian stallion Rembrandt. Rembrandt is a champion competing and winning in 4th. level dressage. He has most recently competed again and won the gold again at 19 years old. It was an honor to paint him and I feel I captured who he really is............a champion. This last fall my son and I visited Rembrandt and the beautiful French Creek Stables where he lives. Once again Don released him with his mane unbraided in a pasture. He takes my breath away! So much so I have a hard time bringing my camera up to get busy taking pictures of him. He is magnificent. No other words fit to watch him run, kick and have a blast.....even at 19 he still acts like a young stallion. I love this horse very much! I have also got to ride him twice! Another event crossed off my very long bucket list. Wide wrap around painted sides. Copyright © 2011 Gena Lee Tharp. All rights reserved. Reproductions strictly prohibited. Paintings and web site information can not be reproduced without the permission of the artist.